Gardening in West Texas-Tomatoes, Tomatoes, Tomatoes! Wow what a busy week it has been. With tomatoes growing so fast we have been loaded! So I have decided to start canning some :) this week alone I collect about 15 pounds of tomatoes and I'm sure tomorrow will bring more. We haven't had any rain which means of course lots and lots of water. This afternoon we finally or a little shower though yay! I don't have a lot if experience with tomatoes and was hoping to keep these plants a long time. It seems though Mother Nature know when the season is changing even without a drop in temps. 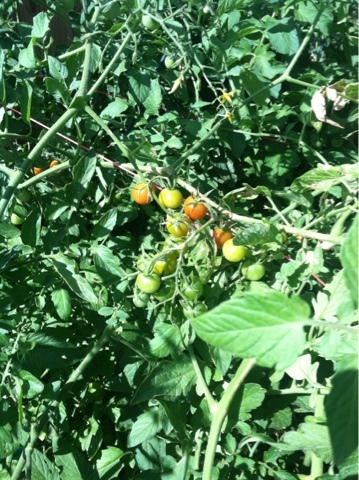 Here are some of our yummy tomatoes. I blanched and skinned a bunch but cant find the photo now lol. I think soon I will do a post on how to do that!